The Germantown Historical Society holds many items related to the Morris family and the Deshler-Morris House, including nearly 1000 photographs. For examples of the photographs, visit http://germantown.pastperfect-online.com/32512cgi/mweb.exe?request=keyword;keyword=morris;dtype=d. Image: Marriott C. Morris. 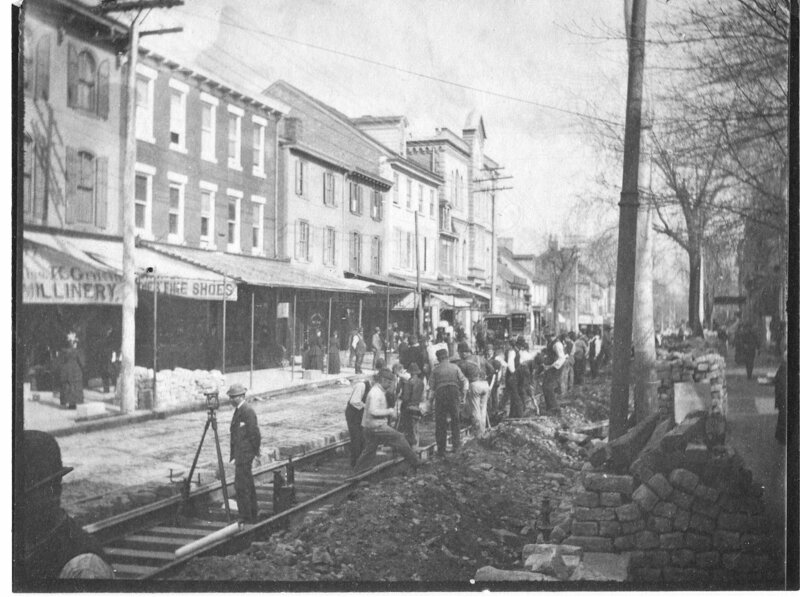 Replacement of Germantown Avenue Trolley Tracks, 1894. Collection of the Germantown Historical Society. This collection is comprised of four volumes of Marriott C. Morris’s scrapbooks. 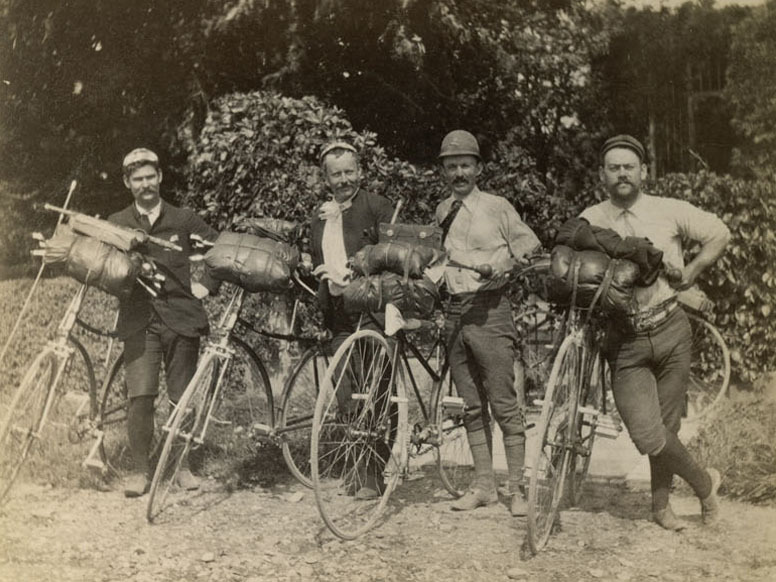 The scrapbooks are largely composed of clippings, pamphlets, and brochures related to travel, bicycling, Haverford College, and the history of Philadelphia and Germantown. This collection is composed of a copy of the handwritten journal pages, as well as a typed transcript, of Jane Rhoads Morris’s journal written for her family at home during her trip to Canada during August and September, 1889. 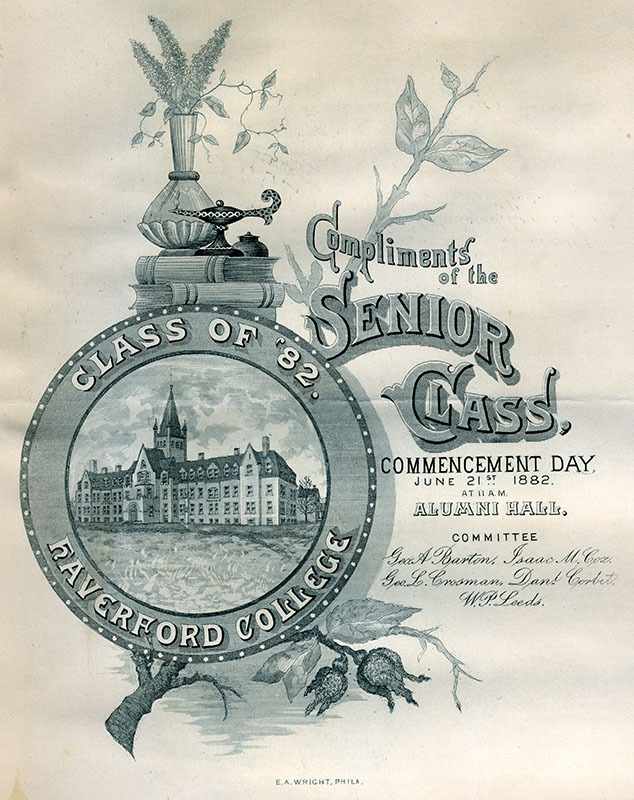 Image: Program from Haverford College commencement, Marriott C. Morris scrapbooks. HSP has more than thirty Morris family-related collections, two of which directly document Marriott C. Morris and are briefly described below. 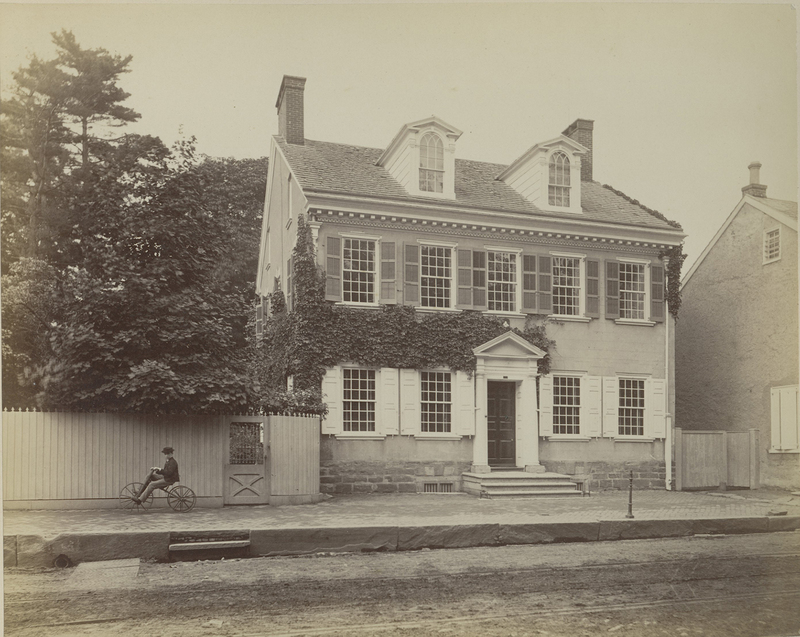 The Morris Family Papers archival collection at Independence National Historical Park focuses primarily on those family members who were owners and/or occupants of the family home at 5442 Germantown Avenue, now part of the park, and includes some Marriott C. Morris materials. Here is a link to the finding aid: http://www.nps.gov/inde/learn/historyculture/upload/REVISED-Morris-Family-Papers-Finding-Aid.pdf. To see the papers contact the park archivist at 215-597-2069. Image: “Morris House on Germantown Avenue, June 1886” (print by Marriott Canby Morris, 1893). Morris Family Papers, Photo Box 8, Folder 2. Collections of Independence National Historical Park. Collection 1005 Marriott C. Morris Photograph Collection is made up of approximately 480 prints (70 of which are panoramic), 130 negatives (120 of which are panoramic), 113 glass plate negatives, a photocopied photo album, and maps, blueprints and documents relating to Morris property in Sea Girt. 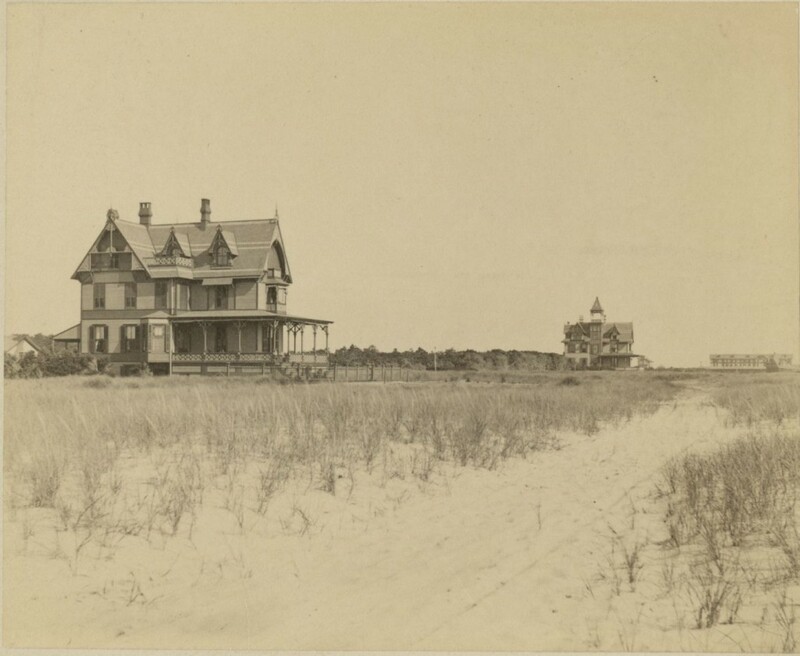 The photographs document the Morris families at Sea Girt and other Jersey shore locations. There are many photographs of Marriott’s home “Cedar Mer” and his father Elliston’s home “Avocado”, as well as the homes of neighbors and friends. www.monmouthhistory.org. Additional genealogical information can be found in the five volume work, The Morris Family of Philadelphia by Robert Charles Moon. Volumes 3 and 4 have been digitized and can be accessed through the links below.